It may look like a bit of a dinosaur design, but the nimble performance and excellent battery life make up for the looks. It has to be said that the Fujitsu looks a little dated in design. It's blocky and square and its 1280 x 800 resolution makes it seem far more old-fashioned than it actually is. It's a nice overall package, but given the price of the Dell Inspiron 1470 for not much less performance, it's hard to recommend the Fujitsu for anything except its lovely screen. What the mobile corporate user needs most from a laptop is the ability to connect to the office wherever he or she happens to be. A great - albeit expensive - combination of features, performance and security. With the 3G support added to an impressive list of connectivity features, the E8210 allows any mobile user to keep in touch practically wherever in the world they find themselves. 80% A dual-core powerhouse for the security-conscious business traveler. Built to withstand the rigors of travel, Fujitsu's LifeBook E8210 combines dual-core processing power with security and durability features galore. Factor in its sub-$2,000 price tag and discrete graphics, and this corporate mainstream system is a good choice for every business user, from junior associates to executives. The system's exterior sports a matte black finish, while the inside is silver with a white full-sized, spill-resistant keyboard. The lid is made of sturdy magnesium rather than the usual impact-resistant plastic, and it's attached to the base by two stainless steel hinges. At 5.9-pounds, the E8210 is easy on the shoulder. The Fujitsu LifeBook E8210, the latest in the company's line of business-oriented thin-and-light notebooks, is by no means exciting, flashy, or inexpensive, but it does offer serious performance and security at a competitive price. The LifeBook E8210 performs as well as the more expensive Dell Latitude D820, totally outperforms the Micro Express EL80, and has more security features than the cheaper HP Compaq nx7400. Corporate buyers looking for a 15.4-inch, wide-screen notebook should consider the LifeBook E8210 alongside the best offerings from Dell, HP, and others. The LifeBook E8210 looks a bit like a cross between an Apple MacBook and a Lenovo ThinkPad. It's all business black on the outside, but opening the notebook reveals a silvery-white interior. On paper, there's a lot to tempt the mobile business user to this latest Lifebook E8210. Not least because, like Acer's Aspire 5652WLMi, it comes with a 3G card slot and aerial integrated into the chassis. In this case, however, it's fully unlocked, so you can use any 3G SIM - the normal restrictions and tariffs will apply. And, like the Acer, this hardware can also revert to EDGE or GPRS if 3G isn't available. That's on top of the 802.11b/g WLAN and Bluetooth, the latter of which will enable you to make voice calls over 3G using a headset. The flexible 3G implemetation is tempting, but the poor battery life and screen quality lessen the appeal. 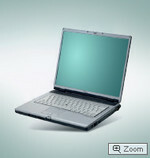 Fujitsu-Siemens should be congratulated for producing the first notebook with an integrated 3G module. OK, so there are a lot of other manufacturers promising similar products, but there’s a lot to be said for actually having working, reviewable hardware rather than just a press release. But it’s not just the 3G functionality that makes the LifeBook E8210 a great notebook, it’s also got one of the best feature sets I’ve ever encountered, great build quality, excellent ergonomics and solid performance. I’m torn between the simple aesthetics, yet ample connections and battery performance. This laptop is by no means the beefiest configured road warrior, nor the flashiest. However – it offers a lot of amenities and very usable computing power under the hood, coupled with great heat management, excellent battery life, and different configurations that can be ordered to fit the bill with a dedicated graphics card…I have to say I’m mighty impressed. Not to mention coming in at a base price under $1,600 for a top of the line “Penryn” CPU and excellent features, I have to put this right up there with the Highly Recommended. It only falls short of Editors Choice because of the keyboard layout/feel, not able to upgrade the RAM further, and the speakers could definitely use a revamp. For a business user, you have to take a look at this form factor as 15.4” is a little on the larger side to lug around – however, carrying a nearly 4 hour battery span definitely evens the playing field. Although it's a solidly constructed business laptop with an appealing design and decent performance, it's hard to make a case for the Fujitsu LifeBook E8410 because it costs much more than competing 15-inch models. Overall, the Fujitsu LifeBook E8410 with Penryn is an excellent option for working professionals in larger companies or IT professionals who need a modern notebook that can interface with older technology. Although the E8410 would still make a perfectly good consumer laptop, the price, performance, and range of features really make this machine a professional tool with a reasonable price point. I would recommend this notebook for business professionals, particularly given the usefulness of the modular bay, huge number of ports, and optional configurations with Windows Vista or XP. If this notebook had slightly better build quality it would easily be perfect for the target audience. Packing durability, a host of security options, and excellent performance, the Fujitsu LifeBook E8410 is a good all-around business notebook. Striking a fine balance between performance and design is the Fujitsu LifeBook E8410, the successor to the E8210. The system packs in all the essentials needed to keep mobile professionals productive in the office and (occasionally) on the go: a fast Intel Core 2 Duo processor, excellent Wi-Fi throughput, security features, a shock-mounted 100GB hard drive, and discrete Nvidia graphics. Toss in a $1,849 price tag and you have an affordable business machine that should satisfy even the most demanding user. Weighing in at 6.2 pounds and measuring 14.1 x 10.1 x 1.4 inches, the E8410 is too bulky for toting around town on a daily basis, but it's still small enough to be a sleek desktop alternative that goes with you to in-office meetings. The business-focused Fujitsu LifeBook E8410 offers security features, a modular bay for expansion, a 15.4in screen, and an optional webcam. he Fujitsu LifeBook E8410 is also light and has pretty good battery life. For improved performance, invest in 2GB of RAM instead of our test unit's 1GB. Fujitsu lays out its usual smorgasbord of security options for safeguarding your data. A SmartCard reader and a security button panel that you can program with a number combination are standard with the Fujitsu LifeBook E8410; a built-in biometric fingerprint reader costs a little more. Our review unit equipped with a 2.2GHz Core 2 Duo T7500 processor would have earned a better WorldBench 6 Beta 2 speed score than 72 if it had carried another gigabyte of RAM. The midsize Fujitsu LifeBook E8410 is by no means flashy, but the laptop has a lot to offer business users, starting with a thorough feature set that includes nearly every port and connection a business user could need, plus serious data security that includes a smart card reader and a Trusted Platform Module. When it comes to performance, the LifeBook E8410 matches that of comparable systems from Gateway and Lenovo, with one exception: our review unit's 1GB of RAM held it back on our Photoshop CS2 test (an upgrade to 2GB would cost $130 if you buy it from Fujitsu). Pricewise, the $1,849 LifeBook E8410 costs about $70 more than a similarly configured Lenovo ThinkPad T61--though the latter lacks some ports and makes you choose between a smart card reader and an ExpressCard slot. The business-focused Fujitsu LifeBook E8410 offers security features, a modular bay for expansion, a 15.4-inch screen, and an optional Webcam. It's also light and has pretty good battery life. For improved performance, invest in 2GB of RAM instead of our test unit's 1GB. Fujitsu lays out its usual smorgasbord of security options for safeguarding your data. A SmartCard reader and a security button panel that you can program with a number combination are standard; a built-in biometric fingerprint reader costs $50 more. 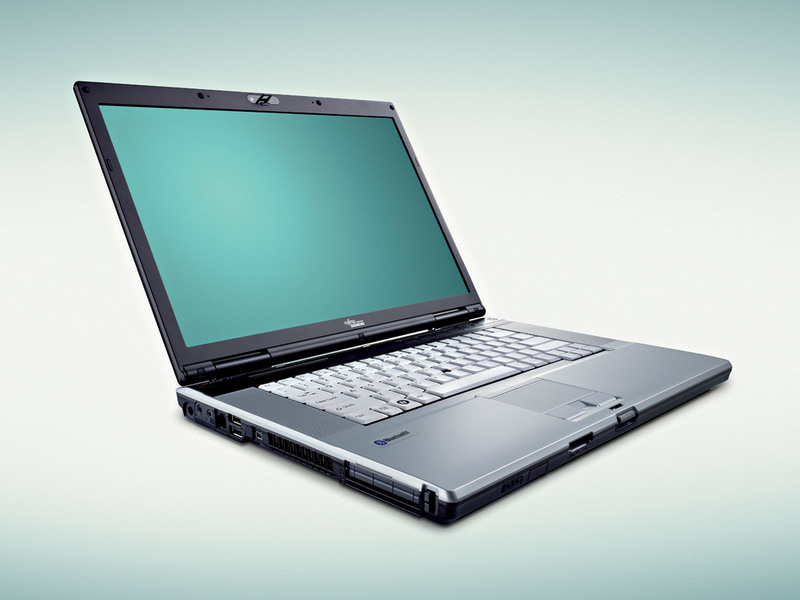 The Fujitsu E8410 is a Santa Rosa updated model notebook featuring a low-end 8400M-G DX10 graphics card but excellent connectivity and port options as well as a great battery life. Let us see how well the E8410 feels and performs, and how well this 15.4” business-oriented machine strikes a healthy balance in its design, power, and usability! Cosmetically, the E8410's exterior consists largely of medium grade black matte plastic with some glossy highlights in the front for good looks. This business-oriented notebook would look goodl in just about any public appearance. It is not too flashy, nor is it too professional looking. The plastic is smooth to the touch without being slippery. However the glossy front "bumper" is definitely a fingerprint magnet. Overall, I would say that the Fujistu E8410 embodies the struggle between battery life and power, heat and noise, price and performance, weight and build quality. The E8410 has great advantages and features … but also a few weaknesses. Fujitsu's LifeBook E8420 is very clearly targeted at the corporate market and not the consumers. Even with this focus, the system seems to lack a number of features compared to similar corporate systems from the likes of Dell, HP and Lenovo in this price range. It might be nice that it comes with a limited number of software programs and a modular drive bay, but most consumers won't really notice either of these features. Intel Graphics Media Accelerator (GMA) 950: Intel Graphics Media Accelerator 950 is an integrated (onboard) graphic chip on Mobile Intel 945GM chipset. It is a faster clocked version of the GMA 900 and supports no hardware T&L (Transform & Lightning) accelleration (which is required for some games). Intel Graphics Media Accelerator (GMA) X3100: Intel Graphics Media Accelerator (GMA) X3100 is an integrated (onboard) graphic chip on a Mobile Intel 965GM chipset. It is the successor of GMA 950 and features a fully programmable pipeline (supports Aero Glass fully and DirectX 10 with newest drivers). The peformance of the X3100 is clearly better than the GMA 950, still demanding modern games won't run fluently.Only some 3D games with very low demands are playable with these cards. ATI Mobility Radeon X1400: ATI Mobility Radeon X1400 is part of the lower middle class. The performance can be compared with an elder X600, but technically it is a X1300, which is scarcely 100 Mhz higher clocked.NVIDIA GeForce 8400M G: The 8400M G is a pared-down 8400M GS with only half as much Stream Processors and a smaller memory bus. Therefore, the performance is much lower and only as fast as the old 7400 card. Only MPEG-2 acceleration.Intel Graphics Media Accelerator (GMA) 4500MHD: Onboard (shared Memory) GPU built in the GM45, GE45 and GS45 chipset (Montevina). Because of two more shaders and a higher core clock, much faster than the old GMA X3100. Still not advisable for gamers (DirectX 10 games not playable or only with very low settings). The integrated video processor is able to help decode HD videos (AVC/VC-2/MPEG2) , e.g., for a fluent Blu-Ray playback with slow CPUs.» Further information can be found in our Comparison of Mobile Graphics Cards and the corresponding Benchmark List. T2600: Second fastest Core Duo based on the Yonah core. Does not support 64 Bit operating systems.Intel Core 2 Duo: This is the Core Duo and Core Solo successor with a longer pipeline and 5-20% more speed without more power consumption. As an addition to the Core Duo design there exists a fourth decoder, an amplified SSE-unit and an additional arithmetical logical unit (ALU).